This particular moment during the Way of the Cross sparks up so many different emotions in the heart, especially because it portrays the perfect love between a mother and her child. A love that is very difficult to put into words. This encounter reveals the great depth of this verse about the Mother of God: “As for Mary, she treasured all these things and pondered them in her heart.” (Luke 2:19) and so I felt a little push from Mother Mary to ponder this station more deeply. It was Mother Mary’s words of concern and love (“They have no wine”) which caused Jesus to start His public ministry at Cana. 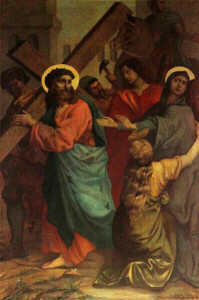 Then, on His Way to Calvary, it was Mother Mary’s loving gaze which would have spurred Him on to complete His mission. At Cana, Jesus said to Mary, ‘Woman, what do you want from me? My hour has not come yet’; but now on the way to Calvary, Jesus looks into His Mother’s eyes and she now fully understands that His hour has come. At Cana, He changed water into wine; now He changes wine into His Blood which is poured out for the salvation of so many. It was at Cana that Mary gave Jesus to the world, and it was at Calvary that Jesus gave Mary to the world. This perfect love between Mother and Son is so deep, it’s indescribable. May we receive the gift of pondering and treasuring the Word of God (Luke 2:19) as we continue to reflect on the gracefilled encounter between the Blessed Mother and Her Divine Son. Lord Jesus Crucified, have mercy on us.